The openSUSE Conference 2014 is being held in Dubrovnik, on the Dalmatian coast in Croatia. The conference venue, also known as the Campus of the University of Dubrovnik is set and ready to accommodate all the Geekos that will visit the conference from around the world. Everyone is happy and delighted about this conference. Read more about this awesome first day! Fosdem is the biggest open source developer’s event in Europe. Geekos couldn’t miss the chance to be there promoting our beloved distribution and of course our next big event openSUSE Conference 2014Â in Dubrovnik, Croatia. One of the most exciting openSUSE Conferences is over. The community proved that everything can be done if people are anxiously engaged. Everyone had fun and was excited about these four days of conference. G(r)eekos had everything set up, from interesting presentations and workshops to night parties, lunch and dinner. All visitors who came to the conference were delighted with the presentations. Keynotes, workshops and presentations about new technologies both software and hardware, community BoFs everything was there. Anyone could attend any session without any special knowledge from a presentation about openSUSE on ARM, an introduction to MySQL, openSUSE’s Release cycle, hacking RaspberryPi, learning about OBS packages and messing around with Puppet. Just as we started the conference with great energy and enthusiasm there is always a time to part ways until the next reunion. Some tears drop and hugs are given as we separate physically until next year. 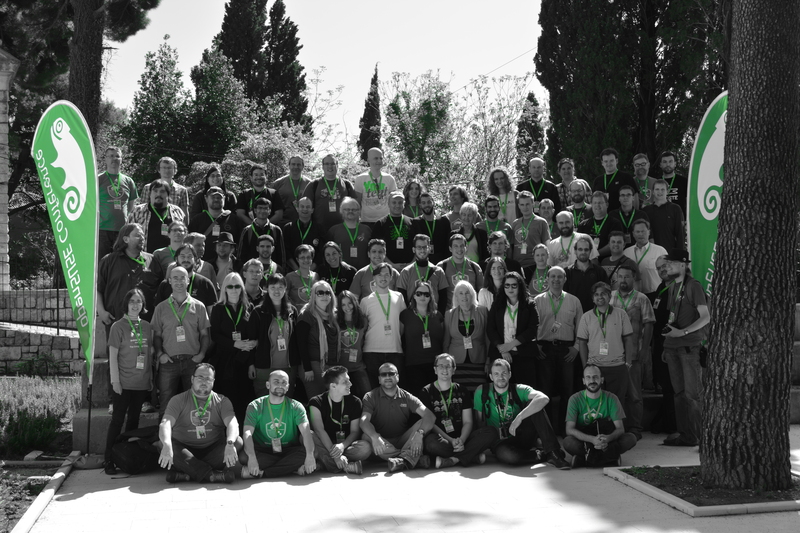 The openSUSE Conference’s final day and reporting is now detailed below. Please read on and maybe you will find some great news for next year. In the mean time, we encourage you to participate of our team. We welcome everyone interested in contributing to an awesome project. Perhaps the best work can be done through your help in between conferences and once the meeting is on again, you can share all the progress you will have made in our community. Join The G(r)EEKOS Release Parties!!! The openSUSE 12.1 distribution is released. After 8 months of hard work by the openSUSE community, the result could be something less than awesome. It is true that openSUSE 12.1 has received the best reviews of all famous open source sites and also has begun to gain many new members at the community, users and contributors. As is known the openSUSE community after the hard work done to release another great distribution, wants to celebrate it! And why not! Around the world communities, Linux groups and LUGs organize release parties. openSUSE 12.1 is already installed on our machines by November 16. The Greek openSUSE community in collaboration with other communities, university Linux teams and LUGs invites you to come and celebrate the brand new release of openSUSE 12.1. Release parties are organized in many Greek cities! If you’re near a city where a party is organized do not hesitate to meet us, attend an Install Fest or a presentation about openSUSE 12.1, drink lots of beers, talk with us and have fun! We expect to meet you at one of the parties, as well as help you organize one in your town! Good company, beer and goodwill are the key ingredients of a successful Release party! On Thursday 1 December we will celebrate in Larisa with a presentation and an Install Fest at 13:00 and afterward we will go at a local tsipouradiko. Moreover, on Saturday 3 December in Kastoria at 19:00 at Zaza bar. Furthermore, on Sunday 4 December we will celebrate in Thesaloniki at Bar Pierrot Le Fou at 22:00. Last but not least there will be 3 more parties that are going to be announcend the next few days. Posted in Project | Comments Off on Join The G(r)EEKOS Release Parties!! !